All big game needs immediate field dressing after the harvest to begin the cooling process for the meat. The guts including organs need to be removed and the cooling process started. A major cause of spoilage of meat is the result of improper cooling of the animal. Preplanning is essential and taking the right equipment for field dressing the game is as important as remembering your rifle. Transporting wild game from the point of harvest to the place where it will be processed varies significantly for each type of big game. The one thing that is common for transporting all species of wild game is - it must be kept clean and as cool as possible. An appropriately sized cooler or refrigerator or freezer must be used. Some initial processing of the meat may be required at the harvest site or at camp followed by additional processing and freezing at the final destination. If you decide not to process the meat yourself, arrangement should be made with a commercial facilities. 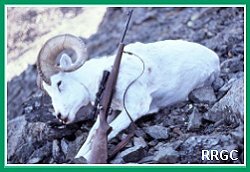 Detailed information on field dressing, transporting, processing and freezing big game can be accessed by clicking on the above links for these topics. I was alarmed on the landing of the Canoes to be informed that Capt. Lewis was wounded by an accident-. I found him lying in the Perogue, he informed me that his wound was slight and would be well in 20 or 30 days this information relieved me very much. I examined the wound and found it a very bad flesh wound the ball had passed through the fleshey part of his left thy below the hip bone and cut the cheek of the right buttock for 3 inches in length and the debth of the ball. Capt L. informed me the accident happened the day before by one of the men Peter Crusat misstakeig him in the thick bushes to be an Elk. ..... Crusat Seeing Capt L. passing through the bushes and takeing him to be an Elk from the Colour of his Cloathes which were of leather and very nearly that of the Elk fired....... Capt Lewis thinking it indians who had Shot him hobbled to the canoes as fast as possible and was followered by Crusat, the mistake was then discovered. This Crusat is near Sighted and has the use of but one eye.